At this time of the year I am definitely starting to slow down, organizing stash, sorting through the scrap bin, and generally re-arranging books, threads, etc so that I can start the new year fresh and rearing to go. Christmas preparations are in full swing, and I really am too busy to accomplish much sewing. The new Hope Valley stash, however, has been calling, and could not be resisted. I have tentatively cut into it, and am enjoying the easy piecing and playing around with the layout. This fabric range was much anticipated, but not an immediate favorite. I am slowly warming to the color palette and the small scale print of many of the individual fabrics within the range, and even starting to play favorites. 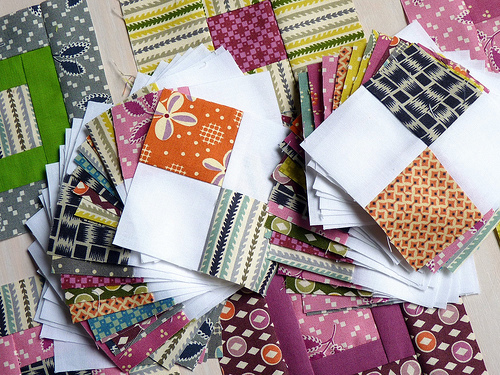 The colours of that range are quite different but will make a stunning quilt. Can't wait to see how you will put them together. I'm really glad my Hope Valley fabrics haven't arrived because I'd be so distracted from all the stuff I need to do! very cool. I am curious what you plan to do with them. These colors are warm and glorious. I love the colours in this range, I may have to buckle and get some. I'm liking the colour mix and I can't wait to see how it turns out. I just love the colors. On my computer it show up as a berry or eggplant colors. I just love that! Hope your holidays are fantastic. I haven't fallen in love with this range yet. Not sure that I will. But your quilt may well serve as some inspiration. I think the crisp white is a good addition. Looks like fun to me! Love the 4 patches. You're right about the need to finish things up, organize, etc. It's a good feeling to have the New Year coming, giving all of us a fresh start on things!